Solitaire is made using the latest techniques in recycling. The process allows plastic waste to be turned into yarn that can be dyed and spun into soft shaggy luxurious fibres. 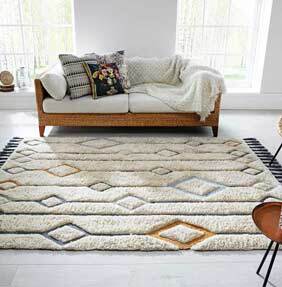 Beautiful recycled silk like viscose is also woven into these beautiful Scandinavian inspired rugs. The end result adds up to an eco-friendly and stunning rug collection that won’t cost the earth! The yarn is space dyed before dyeing to create varying tones in the yarn. This process makes each rug unique in character and gives vibrancy to the rug.Solitaire is hand tufted by skilled craftsmen in India, each rug is finished with a rich plaited fringe. Choose from 3 design options all made in 2 sizes.